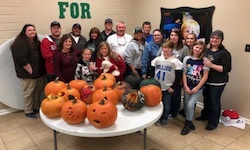 MONTICELLO, AR (November 3, 2017) -– Last Saturday SeaArk Boats hosted a pumpkin carving and decorating event at the Arkansas Baptist Children’s (ABC) Home of Monticello. More than 30 children and adults participated in the event which included pumpkin carving and painting for the children. SeaArk staff also cooked hamburgers, hot dogs, and spooky treats for dinner. To find out how you can help support the ABC Home visit: www.abchomes.org.